Although bulldogs were historically fighting dogs, they can be lovable and gentle companions to their owners. 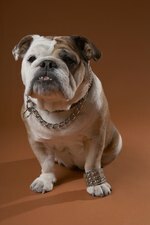 Bulldogs are among the favorite breeds for guard dogs due to their fierce loyalty, protective nature and formidable appearance. These dogs are naturally muscular with a strong bite; however, some owners may wish to aid in the muscle growth of their dogs. Much of how muscular a bulldog becomes is due to genetics; however, a healthy diet and proper exercise will contribute to the development of muscles. Feed your bulldog a well-balanced puppy food until it reaches a year old. As long as your bulldog puppy gets plenty of exercise, you can feed it as much as it wants. After a year old, feed a young bulldog adult dog food three times a day. In older age, you may need to reduce feedings to twice daily. There are specialized foods for bulldogs, so you may wish to consult with your veterinarian about what type of food is best for your dog. In general, however, any brand of dog food that does not contain soybean products is sufficient. Supplement your bulldog's diet with natural, high-protein foods, such as eggs or yogurt. These additions to your dog's diet will provide the protein necessary to build muscle. Exercise your bulldog daily. You can do this with regular walks or even a prolonged game of fetch. When your bulldog is healthy and happy with the proper care, it is more likely to develop the strong muscles associated with the breed.